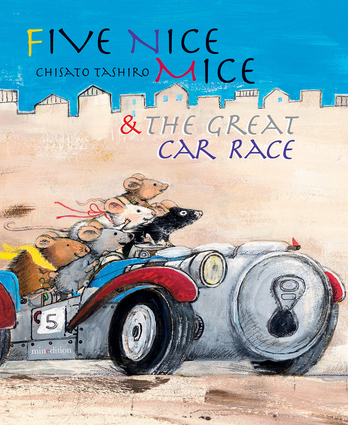 Lively illustrations lead to victory in this sweet story that promotes working together to achieve success With their eyes set on a grand prize of the biggest piece of cheese they’ve ever seen, the Five Nice Mice set out to work on building an unbeatable racecar. But before they can cross the finish line, they must elude a dog, heavy human feet, and a big, bouncing red ball. Do they have what it takes to win the competition? This uplifting tale of team spirit and achievement enchants and engages with vibrant, detailed illustrations. Chisato Tashiro is a children’s book author and illustrator. She illustrated the picture book Voices of the Forest for Expo 2005, the world’s fair held in Aichi, Japan. She is the author and illustrator of Chameleon’s Colors, Five Nice Mice, and Five Nice Mice Build a House.